Even as a woman is condemned to be hanged in Pakistan, her last wish is to be allowed to tell her story to the world from the gallows. Even as newspaper reporters and the TV media collect below her, she begins her tale. Somewhere in bustling Lahore, a Hakim (Manzar Sehbai) in want of a son forces his wife to give birth to seven daughters. After the eighth-born boy is discovered to be a hermaphrodite, the eldest daughter Zainub (Humaima Malik) decides that enough is enough, and has a vasectomy done on the mother. The tyrannical father, feeding the family on a dwindling income, is enraged at the turn of events. The fiery venom from the father’s mouth finds its answers in only Zainub, even as the Hakim interprets religion to suit his interests. The women are not allowed to leave the house, nor are they allowed to study. The neighbours try to secretly help, with the son allowed to venture out to earn from his passion for drawing, and tragedy follows. Repression has never done anyone any good. 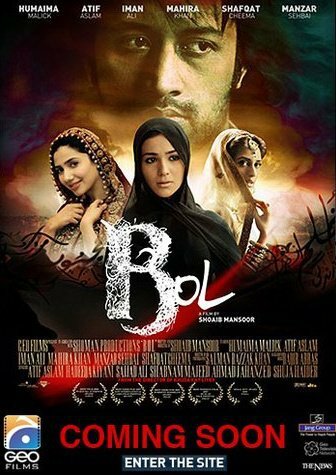 Pakistani Director Shoaib Mansoor’s last release, the sincere Khuda Ke Liye (2007) had a genuine issue, and more so, does Bol. The proceedings could have had a tighter screenplay at instances, and there a few over-the-top moments, the effect in totality is devastating to a degree. The consequences of suppressing human freedom, the caged lives of woman, and the dreariness of a compromise-filled life is all brought to the surface. A must watch. Note has to be made of the performances, all up to the mark, with the famous singer Atif Aslam making it to the supporting cast. Again, as in Khuda Ke Liye, the soundtrack is clean and heart-felt, Indian Hindi film composers can certainly learn the importance of not mashing in western elements for the sake of sounding cool. The standouts and these are not the only ones – two Atif-Hadiqa duets Hona tha pyar and Kaho aaj bol do.